But really, why mess around? As I previously argued on Twitter, why not just play the very best every year at pro basketball’s annual weekend gathering of the highest and mightiest? That would be Marvin Gaye’s never surpassed 1983 National Anthem at The Forum, which used to be the Los Angeles Lakers’ playground. Here it is again in all its soul-stirring glory. And if I’m the NBA brain trust, I just put it up every year rather than let others attempt the impossible by trying to match or top it. It simply can’t be done. Tragically, Gaye was dead a year later, shot and killed by his father. He was a troubled and tormented man, but on this particular occasion, his voice never shone brighter. We’re going to revive this page on a hoped-for once-a-week basis with an eclectic collection of short videos worth watching. This one shows how Breaking Bad might play as a laugh track-spiked ABC sitcom. The setup: Walter White (Bryan Cranston) returns very unexpectedly to the family home, with son Walt Jr. (RJ Mitte) delighted while wife Skyler (Anna Gunn) immediately calls the cops. It’s all perfectly played -- for guffaws, an awwww and some audience applause. The title is more than a little misleading, suggesting an intergalactic series or at least a bloody war front of some sort. But during election seasons, Battleground also can be a hotly contested state. And hulu.com doesn't yet have budgets big enough to accommodate a lot of scope, costumes or special effects. What we have here then is strictly earthbound and filmed in your friendly content provider's old school daze city of Madison, Wisconsin. Battleground, launching Tuesday, Feb. 14th on both hulu.com and hulu plus, is scheduled to run for 13 episodes in half-hour chunks. It's hulu's first original scripted series and for the most part plays like a semi-promising minor league pitcher without good enough stuff to play in the Bigs. Nice try, though, and everyone has to start somewhere. 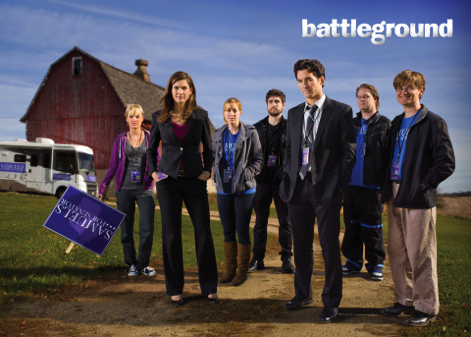 Battleground's theme song and talk-to-the-camera interludes are reminiscent of The Office and its numerous offshoots. It's also at least mildly derivative of HBO's landmark Tanner '88 series, in which a fictional presidential campaign was tracked from the inside out. Hulu's first two episodes of Battleground fall well short of both antecedents. The campaign staff for plain-faced, middle-aged U.S. Senate candidate Deirdre Samuels (Meighan Gerachis) is notably young and pretty but not very believable. And an incoming volunteer named Ben Werner (Ben Samuel) is impossibly naive and wide-eyed -- to the point where you'd like to grab his shoulders and shake him for the remainder of the premiere episode. Running the show is Chris "Tak" Davis (Jay Hayden), who has GQ model looks but way too nice a temperament for a campaign manager of even a school board race. Tak's chief media strategist, Kara "KJ" Jamison (Teri Reeves), likewise lacks the requisite bite. There's also one-note Jordan T. Mosley (Jordan T. Maxwell), who likes to think he's a key operative but is actually the campaign's "copy room advisor." Add speechwriter Cole Graner (Jack DeSena), who's romantically involved with KJ, and campaign helper Lindsey Cutter (Lindsey Payne), who's warming to Ben. And Ali Laurents (Alison Haislip) is increasingly indispensable as the "social media director." The would-be senator they all work for is decidedly charisma-challenged, as is the show. Battleground's first two episodes, while not unwatchable, don't achieve enough liftoff to merit must-see return trips to hulu for further weekly adventures. The whole enterprise is too labored and forced for that. Waiting for Battleground to jell seems like too much of a losing proposition. A candidate who seemingly has nothing going for her only compounds matters. 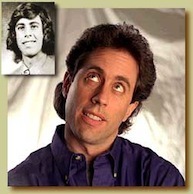 The brand new jerryseinfeld.com not surprisingly is all about him. But if he's being a show-off, it's to our advantage. Let him explain under the "What Is This?" heading, in which Seinfeld notes that he started watching stand up comics on TV when he was 10 years old. "I fell in love with them and I'm just as fascinated with stand up comedy today," he says. Furthermore, "when I started doing TV, I saved every appearance on every show I did." So what he's done lately is sift through all of his old stuff and pick three brief bits a day to post on his website. They all "still amuse me for some reason or another," he says. "Somewhere out there are ten year olds like I was just waiting to get hooked on this strange pursuit. This is for them. I'm just hoping somehow it will keep this silliness going." One of his three Wednesday, May 11th submissions is "Rooting For Laundry." 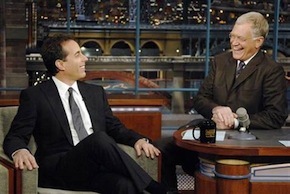 with which he regaled David Letterman during a 1994 appearance on his show. Fans who cheer for sports teams, he says, are really "rooting for clothes" because the players keep changing from season to season. It's an amusing little sniglet. Here's one problem, though. Right now you can't access the previous day's bits. Or anything else other than the three riffs currently on Seinfeld's daily menu. So you may not see this in time to watch "Rooting For Laundry." But you may be just in time to take in the Thursday, May 12th trio of "Golf is an avoidance technique; Closed captioned for the movie impaired" and "The post office is like a lava lamp." Seinfeld needs to fix this. Otherwise it's a great idea. "Welcome to Cambio, where fans become friends"
The new website Cambio is the latest way for celebrities of a certain age and status to blow past conventional media outlets and go directly to their fans. In other words, it won't be warts and all. What you'll see is what they want you to get. Launched Tuesday, Cambio (which means change in Spanish) is a production of AOL, MGX Lab and the Jonas Group, which reps the Jonas Brothers (who have a home in North Texas), Demi Lovato (whose mom was a Dallas Cowboys cheerleader) and Season 6 American Idol champ Jordin Sparks among others. Aimed at 13-to-24-year-olds, Cambio is a "safe environment" for stars to communicate with fans, Kevin Jonas Sr. told The New York Times. A visit to the web site Wednesday immediately cued up a video of Lovato welcoming customers to Cambio and touting her filming of the premiere episode of Cambio Cares in Santiago, Chile. The Jonas Brothers -- Nick, Joe and Kevin -- also provide a brief video taste of their new Road Dogs softball team, with more coming. For now you get a collection of squealing fans, a snippet of game footage and Joe Jonas declaring, "I'm not trying to boast. I'm just saying we're gonna win. We're gonna win with all my force." Whatever develops, you probably won't see any ground balls going through his legs. Another early feature, Cambio Connect, is hosted by an aggressively exuberant guy named Quddus. 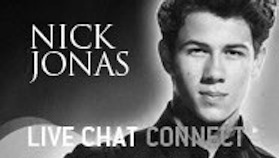 Fans are encouraged to interact with Cambio's roster of stars via Twitter, Facebook and youtube. They're also urged to send in questions, but don't throw any sucker punches. In the first installment, Allison J 20 asks Sparks what it felt like to win American Idol. "It felt so amazing," she says in part. Sparks also experienced "surprise and awe." Well, there you have it -- and welcome to it. And here's that Road Dogs video.